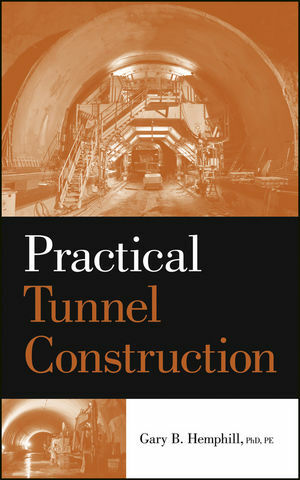 Practical Tunnel Construction fills a void in the literature for a practical guide to tunnel construction. By taking the reader through a brief introduction and history to a comprehensive discussion of how the geological factors affect tunneling, the author covers the stages and technology that are common today without using complex equations. Written for the individual who does not have an extensive background in tunneling but who has to make tunneling decisions, the various tunneling methods are discussed to help in the determination of the appropriate method. The methods discussed are: hand mining, drill/blast, Tunnel Boring Machine (TBM), New Austrian Tunnelling Method (NATM), Norwegian Method of Tunnelling (NMT), Roadheader, Earth Pressure Balance Machine (EPBM), and Slurry Pressure Balance Machine (SPBM). This book focuses on driven tunnels. Practical Tunnel Construction is an important resource for students, construction managers, tunnel designers, municipal engineers, or engineers who are employed by government agencies or corporations that are exploring the feasibility of planning and designing or building a tunnel. GARY B. HEMPHILL, PhD, PE, has more than thirty years of experience in the domestic and international construction industry. He has served as the project manager, designer, estimator, construction manager, field engineer, tunnel/shaft engineer, and project engineer on major projects throughout the world, including the Dallas Area Rapid Transit rail extension and the Taiwan High Speed Rail Project. He is the author of Blasting Operations.